We have a FUN challenge for everyone over at Shopping Our Stash beginning today! Our theme for the challenge is to use a new technique you've never done before - just remember to use up some of your stash while doing it. Check out our blog for all the details and see the fabulous inspiration from the DT! I'm probably not only technology challenged - but also new technique challenged as well! LOL! But, in getting in the spirit of this new technique stuff, I decide to try the Baby Wipe technique. If you've never done it before (like me) you can find the instructions on Split Coast Stampers under the Resource section. I used a CTMH image (Flutter) that had never seen ink before and to get the colors on this, used some pink, green, and blue re-inkers. The sentiment is Loving Thoughts from SU. I also used an embossing folder that I've had for a while but never used. A CAS card but like the way that dragonfly looks with the different colors. Thanks for stopping by.........and head on over to Shopping Our Stash and enter our challenge. So pretty- love the embossing folder you used and the dragonfly! Lynn, fantastic technique - worked so beautifully with this image! I love the clean and fresh look of your card. Wow, gorgeous colors. Will definitely try this technique. Another fantastic CAS card. That dragonfly stamp is perfect for this technique! I love that EF and bet you'll be using it again soon. It's gorgeous! Love the CASness of this card. So pretty! Lynn - This is so beautiful! I love everything about this card! That's a great embossing folder I have never seen. Its great for backgrounds I think. I also love the blue with the dragonfly. 3 mats are very effective! Love how that looks! Beautiful card Lynn, love the soft colors and the gingham bow really sets the entire card off! I'm still chucking about the gnats! Wow!! Awesome!! The dragonfly is so cool!! I love that embossing folder too!! I pinned and watched this tutorial and have baby wipes on my shopping list! This is a perfect use of this technique. How sweet. I only have a couple re-inkers...I know what I will be adding to my first SU order! LOVE this! great technique Lynn, and I love your reverse embossing on this card...if it is reversed? if not, I am loving this folder! This is beautiful Lynn! I LOVE your butterfly and the fabulous colors! I need to check out that technique, because this is gorgeous! This one turned out awesome! 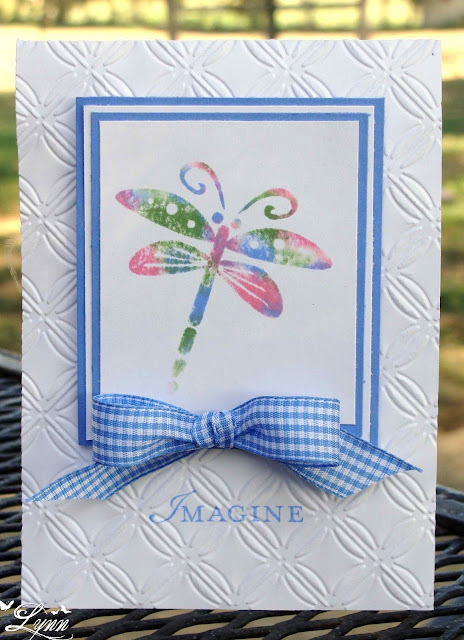 I just LOVE the look of that dragonfly that you did with reinkers, and the embossing folder looks so pretty too! NJ! What a cool card - love the colour combo! the embossing folder is so nice! fabulous card Lynn...... love the way the dragonfly turned out and you have showcased it perfectly. Ooooh, this is beautiful, Lynn...the blue against the white is sooo pretty and I love the colors on the dragonfly!!!! Fabulous technique Lynn and such a pretty card. Love the embossing and nobody can tie a bow like Lynn! This is fantastic! Love how your dragonfly turned out! This is one of those techniques that I filed and never did anything with... The embossed background is fantastic!